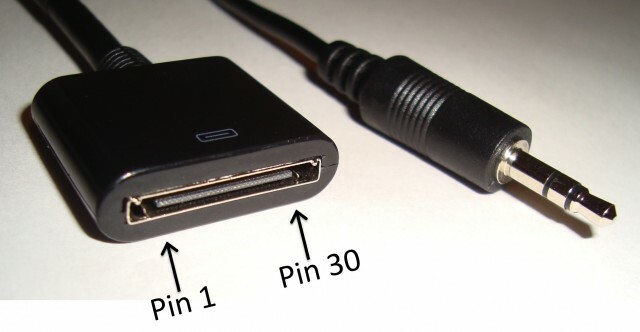 The first generation of Bose SoundDocks did not feature an aux input jack, they are only compatible with the 30 pin connector of iPods and iPhones. Lately, my music player of choice is my Droid Razr, which has 60+ Gb of music on it, even more in the cloud, and no 30 pin connector. I decided to add an auxiliary input to my SoundDock in the easiest and quickest way possible. I made an adapter cable using half of a $6 iPod extension cable, half of a $1 3.5mm headphone cable, and two necessary resistors. I can plug this adapter cable directly into any unmodified SoundDock, or any other amplified speaker system that has a 30 pin connector. It turns out that the SoundDock is smart, and will only power on when it senses 3.3VDC on pin 18 of its input connector. Luckily, it also outputs 12VDC on pin 19 to recharge the attached iPod’s battery. To trick the SoundDock into turning on with no iPod attached, I made a voltage divider by soldering a 20 Kohm resistor between the wires connected to pins 18 and 19, and a 4.7 Kohm resistor between the wires connected to pins 18 and 1. The voltage between pins 18 and 1 was measured to be ~3VDC, which isn’t 3.3VDC, but is sufficient to power up the SoundDock. I soldered the three pins of the 3.5mm headphone jack to the 30 pin connector’s wires as follows: Ground to pin 1, right audio to pin 3 and left audio to pin 4. I used 1206 surface mount resistors because they measure only 3.2mm by 1.6mm, a size which fits conveniently under the shrink wrap joining the two cables. The most time consuming part of this two hour project was identifying which color wires were connected to pins 1,3,4,18 & 19, and determining if the pin on the left of the photo was #1 or #30. This entry was posted in audio, electronics and tagged audio, bose. Bookmark the permalink. Or, how much would you sell one for? Hi Dan, You really need a DMM and a soldering iron for this project. I won’t sell you a completed cable, but I’ll share all the info you need to make your own! I liked this project but like Dan I am no Techy. Is there a posiblity of finding this on the internet? Hi Prem, If you’re not as tech savy, you may be able to purchase a 30pin bluetooth adapter! Just choose one that says “Sound Dock Compatible” and they’ll have soldered in the resistors to provide voltage to the necessary pin to activate the sound dock! Greetings. Sorry to ressurect such an old thread.. I have a Sharp Boombox GX-M10.. would this cable work for me as well? Or should I modify anything else?